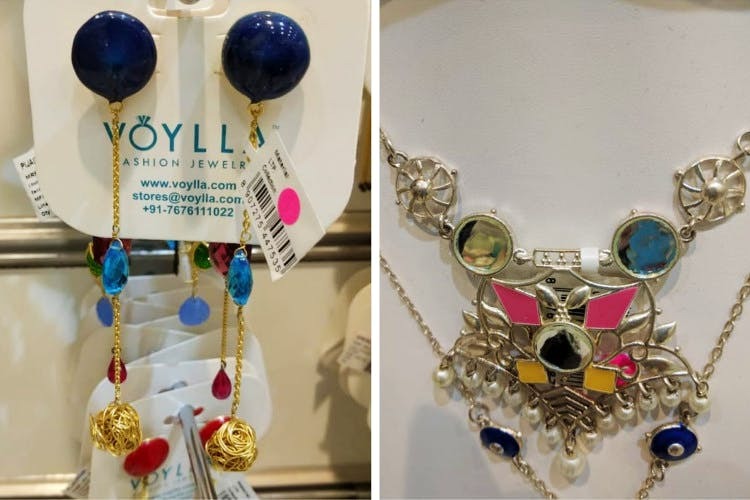 If you're familiar with Voylla Fashion Jewellery and the lovely pieces they craft in their studio, you might be super excited to know that they have opened their first flagship store in Next Galleria Mall, Panjagutta. The first thing that caught our eye at the store was the oxidised metal jewellery — a specialty of Voylla — that comes in several colours and patterns. Find yourself gawking at the elegant 9-5 pieces like geometric drop earrings, minimalistic pendants, but don't forget to grab some maang tikas and bracelets on your way out. Whether you're looking for budget or luxury statement pieces, the spectrum of the collection is wide and they also have pieces that are exclusively crafted for bridal wear. In fact, the wedding collection is rather elaborate and tucked towards the end of the store. Right from the jhumkas and neckpieces to the chaandbalis and pearl jewellery, the store has stocked up on grand pieces only. Plus, the collection of kamar bandh and bajubandh (or vanki) are for those who don't want to go all out on gold jewellery. While you are at it, make a mental note to check out the Sterling Silver beauties, especially the rings. The price range begins at around INR 250 and goes upto 15,000. Since the store is fairly new, it doesn't have all the stock that's on their website. From what we noticed, they have curated just the bestsellers.